Smartflow Stainless Steel Manifolds are made to last. Superior hand-welded construction and high quality stainless steel components create a reliable product on which industry depends in demanding applications. Industries served include: Military, Aerospace, Semiconductor, Plastics Injection Molding, Extrusion, Luxury Yachts and more. 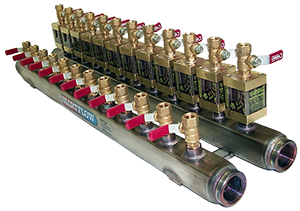 Smartflow Stainless Steel Manifolds are available in standard and custom sizes. If we don't stock what you need, contact us with your concept, sketch or fully detailed drawing. Assembly services are also available. We add your specified valves, fittings, temperature or pressure gauges as needed. All manifolds are 100% leak tested to 250psi. Conventional Stainless Steel Manifolds have a more robust construction with half-couplings welded to the tubing to form each port. These are recommended for manifolds that experience multiple changes to fittings or couplings. Other port and inlet sizes are available on a custom basis. Please call or email for information. Low-Profile Stainless Steel Manifolds are a more economical option. NPT ports are formed into the tubing. British threads are not available in the low profile manifold. This option is recommended where ball valves or fittings will be permanently installed into the ports without future change. Optional ball valves, flowmeters and regulators can be installed to suit specific applications.